In the labyrinth of Kolkoris a monster lurks, hiding its face from the immortal gods. It has ravaged countries and eaten the flesh of the living, but now the gods have declared that the Beast must die. 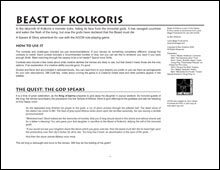 Yep, Beast of Kolkoris is ready for download. Big thanks to Antagonist Phil Lewis and his players, Gene Hughes, Tom Peters and Mark Trosien, plus all the brave players who burned through so much Fate in the first playtest round: Gavin Cummins, Mike Frost, Kevin Lewis and Ching-Ping Lin. Think you can do better against the Beast? Now’s your chance. If you have your own, post a link here.